Blood pressure, sometimes referred to as arterial blood pressure or hypertension, is the pressure exerted by circulating blood upon the walls of blood vessels. The blood pressure in your circulation is principally due to the pumping action of the heart as well as cell salt content. 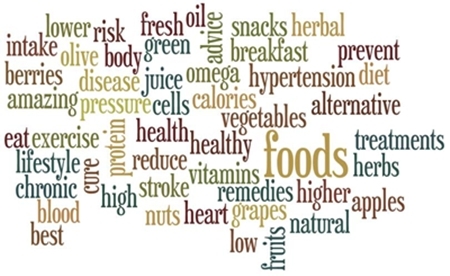 You can greatly reduce your risk for high blood pressure through some lifestyle changes and your food intake. A healthy diet high in fruits such as berries and fresh apples, green vegetables and good fats such as olive oil – that can reduce the risk of developing high blood pressure. Let’s know more about how these foods can actually help keep away from blood pressure. Flaxseed can be found in several health products these days, including whole grain breads, granola bars, protein bars, and blue corn tortilla chips. They are the highest plant-based sources of alpha linolenic acid (ALA), an omega-3 essential fatty acid. Two tablespoons of flaxseed contains 3.5 g of omega-3, which amounts to 140.4% of your daily value intake, and the composition of flaxseed oil contains 58% omega-3. Omega-3 (alpha linolenic acid) is widely known to help reduce your risk of cardiovascular diseases. When your blood pressure is abnormally high, it can result in premature death from heart disease, stroke, or atherosclerosis. There is research that links the consumption of flaxseed or flaxseed oil with helping lower blood pressure in people with hypertension (high blood pressure). Resveratrol is a naturally-occurring chemical found in high concentrations in the skins of red grapes. It is classified as a polyphenol that possesses some unique biochemical properties including potent antioxidant capability. As you would expect, red wine is a very good source of resveratrol; however, concentrated extracts are also available in supplement form. Resveratrol can lower blood pressure indirectly and directly. Indirectly, the intake of resveratrol improves insulin sensitivity, which keeps blood sugar and insulin levels lower after a meal. Lower levels of insulin and improved insulin sensitivity are directly responsible for a drop in blood pressure as levels of inflammation are also much lower. Sunflower seeds are best natural supplements to lower blood pressure. There are several factors why snacking on unsalted sunflower seeds or adding them to your meals can contribute to lower blood pressure. In just a quarter cup of sunflower seeds, you are getting 61.5% of your daily value of vitamin E. The fat-soluble vitamin is essential for proper use of vitamin K and for making red blood cells. Sunflowers are also good snacks for protein. The sunflower seed’s fiber contributes to the whole package of nutrients that help lower your high blood pressure. These foods contain healthy fats from the omega-9 family. The intake of these types of fats has also been associated with lower rates of hypertension, because the omega-9 fats can also affect the artery walls. These foods contain chemicals that can decrease inflammation, reduce free radical formation, and cause relaxation of the arteries. The omega-9 fat content can also decrease cholesterol and inflammation. I recommend that you consume one to two servings of nuts or one tablespoon of olive oil daily.